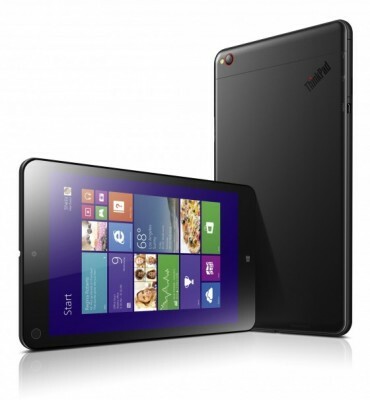 Compact Lenovo ThinkPad 8, top 8-inch tablet made ​​of machine-cut aluminum, comes equipped with technologies that are professionals need to succeed. Satisfies those who want great portable device, without sacrificing connectivity to the keyboard and screen for a complete PC experience. In motion using it in tablet position. Connect it to an optional base for the keyboard, dock or monitor for use as a desktop computer or turn its optional Quickshot Cover over the tablet to set it up in the Tent position. In addition, users with Quickshot cover allows easy and intuitive photography and filming. Users simply take off the cover of the tablet in order to discover a camera of 8 MP high resolution, which encourages application launch for the camera. Users can view and edit photos on the super clear 8.3 – inch 1920 × 1200 display and wirelessly transmit them using Miracast technology or watch them with the help of cables using his microHDMI entrance. Supporting a full PC experience, the ThinkPad 8 is equipped with the latest Intel Bay Trail four-core processor, up to 128GB of storage, a microUSB 3.0 port, LTE2 connectivity and full Windows8 Pro experience for professional purposes. Companies can also opt for a variety of services and solutions for the provision of support to suit their needs. With the new Advanced Exchange warranty upgrade option in the U.S. and Canada, Lenovo raises the bar for experience-related support for tablets. This update provides an alternative tablet a day after determining that the user’s tablet is broken. The user simply sends back the original tablet in the prepaid box to send and retains replacement. With the same serial number as the original tablet, replacement facilitates corporate monitoring and management of leased products. With ThinPad 8, Lenovo also presented the new Lenovo ThinkPad X1 Carbon laptop. The starting price of ThinkPad X1 Carbon model is $ 1,299 and will be available from the end of January. ONELINK Dock Pro is available now for $ 179 .. Convertible tablet ThinkPad 8, with the configuration for the basic model will cost $ 399 and Topseller models will have a starting price of $ 429 and will be available by the end of January.